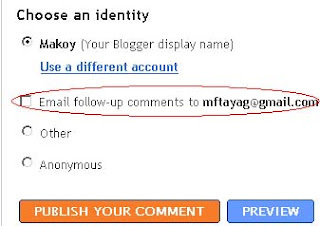 Blogger just announced that a new feature “Subscribing to comments via email” has been released. I have been browsing for this kind of widget a week ago coz I saw that WordPress blogs are already equipped with this. According to Blogger Buzz, “This makes it a lot easier to stay in the conversational loop after you’ve commented on a post somewhere.” In short if you subscribed to it, you would receive comment follow-ups via email from all respondents making it easy to keep track of the topic. You may locate this feature at the bottom of comment page. The downside though, only verified Google (Gmail) accounts are allowed to use this feature. just when i switched to haloscan for my comments and trackbacks, blogger improves its system.